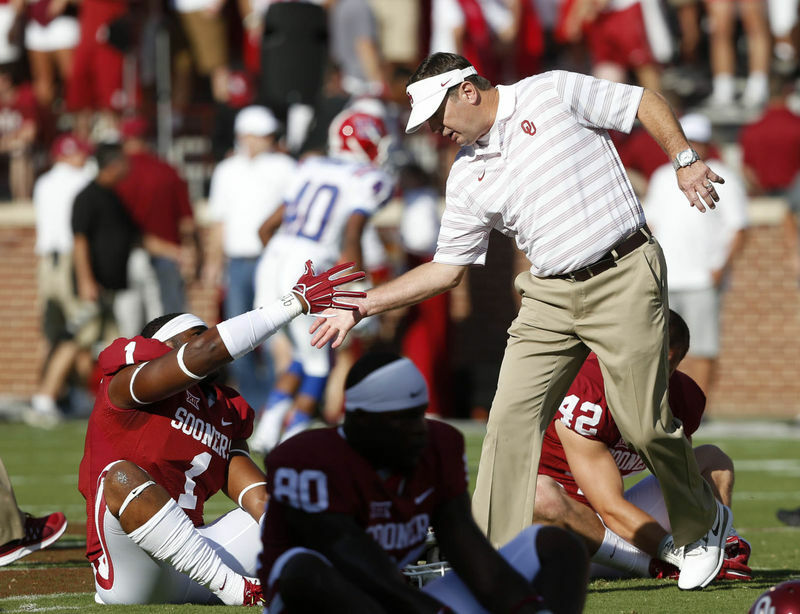 NORMAN — Something momentous happened to Oklahoma football coach Bob Stoops last week, something a little more personal than winning a championship, producing an NFL draft pick or capturing some coach of the year award. “It means more to me, maybe, than anything,” he said Thursday. Stoops won the anonymous poll with five votes, two more than Michigan State’s Mark Dantonio and Stanford’s David Shaw. They could have picked anyone, and they chose him. It was the second such honor for Stoops, who tied then-Georgia coach Mark Richt in a similar ESPN poll of 98 FBS coaches in 2014. I brought it up with Stoops on Thursday, worried he might brush it off like it was a preseason AP vote. I learned immediately I was wrong. I’ve covered Stoops every year at Oklahoma but his first. Ask me to describe him, the first thing that comes to mind is “loyal.” That goes for his players, his staff, his family, his hometown and his buddies. That goes for his profession. Stoops is a coach to the bone. I’ve lost count of the number of coaches he has referred to as “a friend.” He has vacationed with some, gone on golf trips with others. He has hosted entire staffs, college and high school. He has spoken at clinics. He takes pleasure in the perks of his job, but also the minutiae. So long as it involves coaching, or fellow coaches. It’s an unbroken rule for Stoops to open postgame news conferences by crediting the opponent and the opponent’s coach. It’s an unbroken rule for Stoops to lament another coach’s firing, to not just say it but mean it. It infuriates him when his players are criticized by media or the general public, and just as much when other coaches are, as well. The winning is nice. The money is very nice. The relationships with/influence on kids might be more rewarding than the money. I tend to think men and women decide to coach thinking they can hit all three jackpots. The best keep at it, winning the most, earning the most and having the most influence along the way. If you are fortunate enough to do all of that at the rate Stoops has, and at a place as relentlessly demanding as OU, it is likely you will eventually be singled out. You will become an example for your industry. The results of the poll did not surprise Stoops’ staff, or those who know him best. It’s a wonderful homage for a man who coaches on behalf of his program and his profession. Maybe the nicest of all.